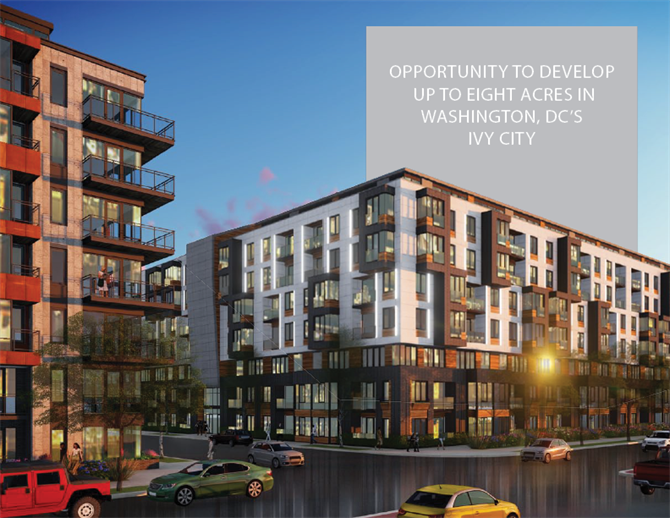 New City DC is a large-scale development opportunity located at the intersections of New York Avenue, Montana Avenue, and Bladensburg Road, NE in one of Washington DC’s fastest growing neighborhoods, Ivy City. With the recently completed Dakota Crossing community to the northeast, the highly anticipated Union Market development to the southwest, and the ground-breaking Hecht’s Warehouse and proposed Crummell School immediately to the west, New City DC is positioned at the center of some of DC’s most transformative developments. Ivy City has become a destination for shopping, restaurants and large-scale retail. Douglas Development, largely through their project at Hecht’s Warehouse, has attracted big-name retailers including Nike, MOM’s Organic Market, Petco, Plant Fitness, BicycleSPACE, and more that are scheduled to open soon. The retail success not only benefits the residents, but also paves the way for continued retail innovation at New City DC and the neighborhood of Ivy City. New City DC offers the rare opportunity to build high-density product using wood-frame construction in Washington, DC. Under the MU-5-B zoning, the max allowable height of 75 ft provides a perfect set-up for a by-right, wood-frame product. The ability to utilize wood-frame construction at the property provides the buyer with a substantially lower-cost option when compared to a concrete alternative. 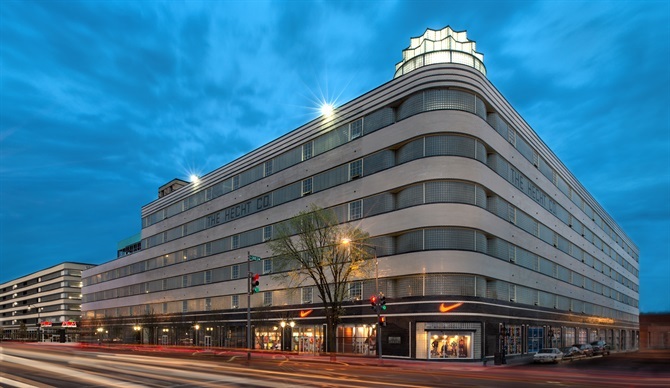 New City DC is ideally located on New York Avenue, which connects downtown DC with eastern and northern points of the city via major commuter routes including Route 50, the John Hanson Highway, the Baltimore-Washington Parkway, and eventually Interstate 95. While parking at the site allows for easy and convenient vehicular access, residents can also benefit from New City DC’s proximity to Union Market, Rhode Island Ave NE and the H Street corridor, all of which are less than 1.5 miles from the property. 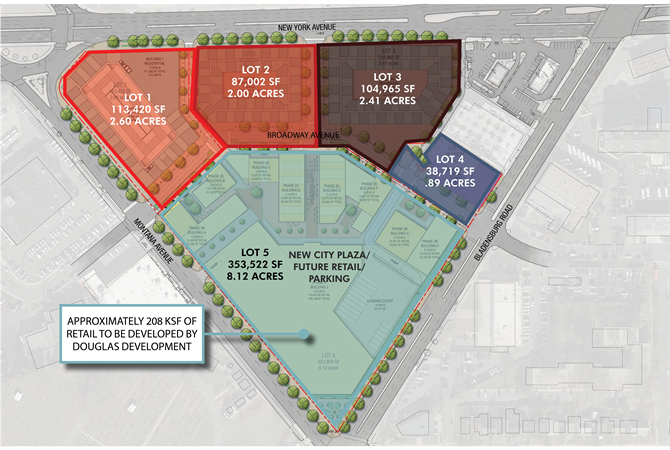 New City is broken up into five theoretical lots, four of which are for sale. The theoretical lots help to present one possibility for the composition of the site. The area designated as Lot 5 is not part of the sale offering and will be developed into various retail by Douglas Development over the next several years. Ivy City is undergoing a renaissance due to recent development activity and is quickly becoming a sought after neighborhood in the District. The area offers potential for both commercial and manufacturing uses as well as parcels of land suitable for mixed-use development, including large-scale retail. 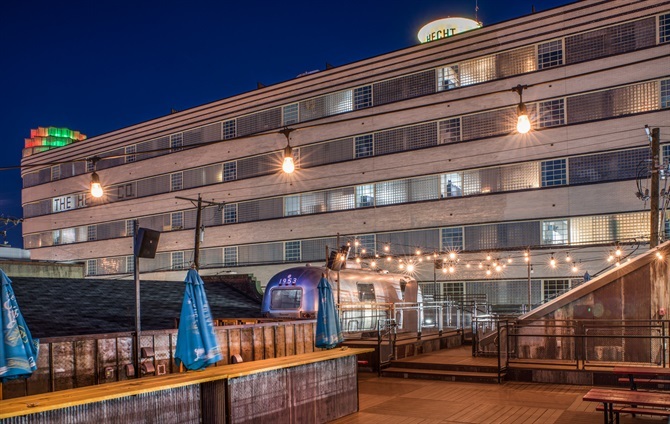 With breweries, distilleries, and incubators such as Atlas Brew Works, Green Hat Distillery, One Eight Distilling, and Union Kitchen’s second food incubator, the area’s commercial vitality is on an upswing. The retail scene in the area is transforming as well with the recent additions of BicycleSPACE, Bikram Yoga, MOM’s Organic Market, a Nike store, and Planet Fitness. Petco, Compass Coffee, and three Mindful Restaurant Group eateries, among other retailers and restaurants are also scheduled to arrive (WDCEP, 2016).